Why Do Portable Fridge Freezers Offer The Best Of Both Worlds? Wondering whether investing in portable fridge freezers is a good idea? If you are looking to buy a portable freezer, perhaps you are doing yourself a disservice. You could, in fact, kill 2 birds with 1 stone by settling for a fridge freezer which is portable instead. For ultimate portability, this unit can be powered by standard household voltage or your car's cigarette lighter receptacle. Plus, this great innovation can either be used as a refrigerator or freezer. It can be easily switched between the fridge and freezer functions. So, there is no need to waste your hard earned money investing in both. It is a time saver. With a car freezer fridge handy, there's no need to detour off your planned driving route to your vacation destination in order to quench your thirst or whet your appetite. It keeps you healthy by taking the guesswork out of what you eat. When traveling in off-the-beaten-track areas, it might be impossible to find fresh, hygienic or healthy food so eating out of your portable fridge freezer may be the only practical, healthful option. A portable/ camping fridge freezer will enable you to pack your own homemade food and cleaned fruits and vegetables for your long haul trip. So a car freezer gives you the power to control what you and your family eat. It enables you to remain healthy by maintaining the right water balance. This is particularly important if you are an avid outdoors sportsperson. To prevent dehydration particularly during the sizzling summer months, you will need to have chilled water, juice and energy drinks ready when you are. 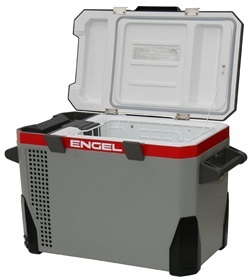 For picnic lovers, a portable freezer is far more versatile than the good old picnic basket. The choices between simmering juice and cold, refreshing juice, or between messy, melted ice cream and an enticing well-frozen ice cream cone are obvious. It will help to extend the life of temperature-sensitive foods such as beef and fish. So a DC freezer fridge will keep the sailor in you well-fed at sea and your fish catch fresh until you are able to cook it or move it to a bigger freezer when you get home. Engel fridge freezers. These are regarded as the Rolls Royce of portable freezers but they are also, not surprisingly, the priciest brand. Their rugged construction and efficient compressor makes them especially ideal for extreme conditions and locations. ARB fridge freezers. The renowned ARB fridge freezers are coveted for their resistance to corrosion and their front mounted temperature control panels. Plus, because they are specifically designed for off-road use, they are pretty sturdy. Edge Star fridge freezers combine the strength and insulation of a freezer into a compact and rugged appliance. Moreover, they are more affordable than the above 2 brands so if you are looking for a cheap DC freezer, this could be a good choice. Whynter camping fridge freezers are versatile. They are ideal for everything from campsites, to fishing boats and RVs. Which Portable Brand Is Best For You? Be sure to peruse each of the above brands carefully before zeroing in on one. Pay particular attention to your desired feature set, real consumer reviews, the length of the manufacturer's warranty and of course, the price. Selecting the ideal portable fridge freezer need not really be a herculean task.